The [wiki]Demon Hunter skills[/wiki] [wiki]interface[/wiki] as seen in the [wiki]beta[/wiki] build, combined from two photographs of game monitors. 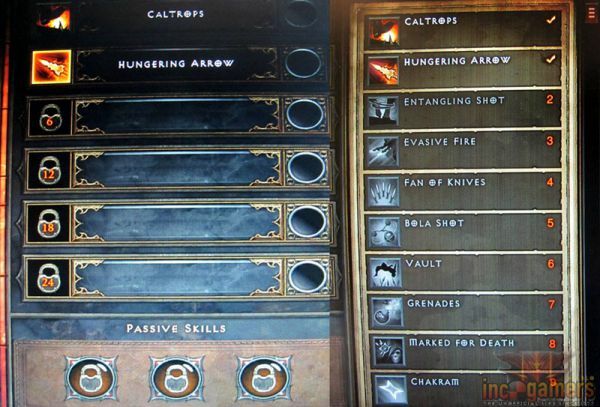 The six skill slots are on the left, with the two skills allowed at Clvl 1 already added. Additional skill slots are available at Clvl 6, 12, 18, and 24. The locks at the bottom of the picture are where passive skills go, at Clvl 10, 20, and 30. Runestone slots are all empty, since runestones were not enabled in this beta test build. Nice work putting the 2 screens together. But this certainly doesn't look like the Wizard's skill interface, but rather the Demon Hunter's. Edited that. The perils of working on 10 things at once.